After defining the goals and identifying the customer and business requirements, we move on to the next phase: MEASURE. The name gives us a clue of what we might be doing is this phase. Measure some parameters? But most of the projects do not have any data to measure as the process is quite new. There will hardly be any metrics or a measurement system. The goal of the Measure phase is to identify and define appropriate metrics and a measurement system that will capture the performance of CTQs (Critical to Quality). To do that, one has to perform the following list of activities. All the above are the features that the product/process should be capable of delivering, failing which either the customer does not get the intended product or the process owner/manufacturer of the product operations cannot run effectively. A CTQ tree can be constructed to group all the features (CTQs, CTPs, etc.) into a single bucket. Tools like Affinity diagram can be used for this purpose. The role of the process expert is very critical in this activity as the CTQs form the base for designing of the process. A measurement plan is nothing but a table that has answers for the questions like What, Who, When, How, How often etc. The above table is a simple representation of what a Measurement plan is all about. Organizations and teams customize and collect additional details in their Measurement plan as per their requirement. Let us continue with the same case study that was discussed in the Define phase. The below would be some of the CTQs from the VOCs. 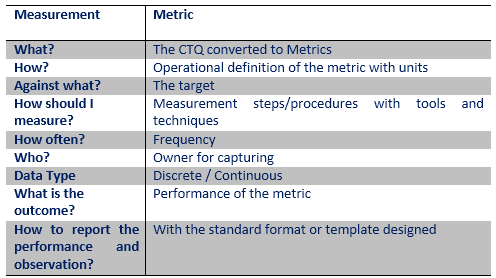 The company then defines the following metrics and sub metrics to evaluate the performance of the process. In this case, the company already was running the process and is now redesigning it. So, some of the metrics may already be readily available. In this case, the target for each metric should be set a little higher than the target for Customer satisfaction %. Because if the target for the metrics are lower than the Customer satisfaction % target that there is no guarantee that the C Sat % will be achieved even if the process metrics meet the target. Many organizations use QFD in the Measure phase to prioritize the design aspects and then frame the metrics. (For the benefit of following the flow of DMAIC and for easy understanding, we will discuss about QFD in the Analyze phase). However, it is equally good to first identify the metrics and then decide the main and substantiating metrics. This allows us to choose the steps/tools suitable to our needs (until it does not affect the purpose and require us to relook at the earlier steps).